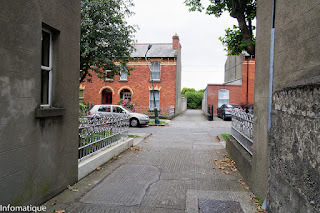 Last week I told you about my day out in Dublin. I didn’t tell you what I did when I was finished there though. I’ll do that now. Most people would just go home. Not me. Nuh huh. I pointed my car in another direction entirely and headed for the town of Gort in County Galway. It was going to be one of those good evenings for me. The Wild Swan Theatre Company in that fine town were putting on one of my plays, ‘Conception Pregnancy and Bert’, and I was driving down there to see it. I get to do this a bit and I feel lucky every time I do. I get to go to a town that I don’t know and find a band of smart talented people there who have taken weeks and weeks learning off some of the silly stuff that I write down in my spare room. They have grappled hard with my pages and figured out how best to perform them. Then they'll play it all out for a willing audience. What a compliment they have paid me in taking this on. How very lucky I am. In the case of the Wild Swan Theatre Company in Gort, that was only the start of it. Imagine my surprise when I marched in to a huge room elegantly dressed, table by table, as if a society wedding party was about to motor in at any moment. Walk around a corner and there was this beautifully set stage with hundreds of seats carefully laid out in front. This was Supper Theatre, except it was more Dinner Theatre as the patrons were about to be treated to a full sit down meal in between the two plays they had come to see. My play was up second, after everybody had been wined and dined. I won’t single anybody out. It was just a great evening. The first play was very well written and performed and went over marvelously with the audience. The second play was a little more odd and maybe a little more edgy. It needed a good director to get its quirky set-up across and a brave cast to play out the rather extreme levels of silliness that ensue. The Wild Swan Theatre Group delivered all of these things in spades. My usual delight is to sit at the back and watch the play and the reactions of the audience at the same time. I can learn a lot from where people laugh, don’t laugh, shift uncomfortably in their seat or even look down at the floor. This time, my cover was blown by a nice introduction from the stage. Never mind. The audience went along with the play as the pace accelerated and there is nothing more satisfying than seeing a room erupt with laughter at some of your own writing. I drove home after a very, very long day, buzzing and happy. So thank you, Wild Swan Theatre Group. It was a great night. I only wish I could figure out how to have more of them. My plays generally end up getting performed by a sort of ‘word of mouth osmosis’ or, as often as not, because somebody saw a production somewhere else and thought the play might suit their group for a performance too. I have quite a few plays and quite a few of them have had quite a number of productions. Which is great. Don’t get me wrong, I know it’s great. It’s just that there’s no plan to it. None on my part anyway. No real rhyme or reason. 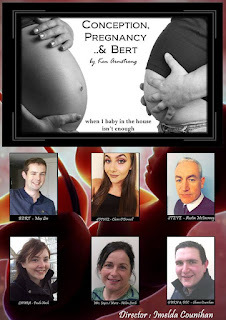 I work hard on the plays, trying to get them as good as possible, and their first productions usually emanate from the wonderful people in the Linenhall Theatre here in Castlebar coupled with my production and directing friends here in Castlebar who all support and encourage me more than I can say. In the case of ‘Conception Pregnancy and Bert’ it was initially born as the third of three radio plays written for and produced and directed by Mary Carr and St. Patrick’s Drama Group in Westport. It then evolved into a theatre play, with the encouragement of some of my Castlebar friends. Once a play has been first-produced, I generally end up at a complete loss as to what to do with it next. Sometimes, as I was saying, word of mouth carries it on to some other adventure. One play has been published and one great production came out of that but then no more. Another play is on the national database for youth drama and that has resulted in three productions since the first so that was good. Sometimes, though, it all just stops in Castlebar and I don’t really do much about it. What should I do? Should I send the plays more vigorously around to theatre groups? I guess I should. That seems obvious even now that I’ve type it out. Should I make the scripts downloadable from this website? Very few people come here, in actuality, so I’m not sure that would be much use but then Google does seem to index the stuff on there pretty well so maybe it might be worth doing. From time to time, I just bang up a link to a script at random and that too has led to a most interesting production. Whatever it might be, I should really do something. Because I like having those great nights out and I love seeing the plays picked up and performed for audiences all over the place. One day last week, I had to drive to Dublin and do some stuff. Dublin is strange for me these days. I feel like I belong there but yet don’t belong there at all, both at the exact same time. My years in London, and in Dublin before that, have left me with a general ease in the big city. This doesn't ever seem to leave me, no matter how small-town-trained I become. Whenever I go there, I tend to slip in to the rhythm quickly and slide easily through the melee. On the other hand, I now also have a tendency to study every single face, to wonder who they are and what their story is. It’s very tiring and it makes me want to get out and go back to my own small town, where I know many of the faces and where I have at least some idea of where they are all going. Here are three small points from my day out in Dublin on Thursday. I’ll set them down in order. As far as I can tell, they are linked by nothing at all, apart from the fact that they happened to me. I had to visit a venerable library reading room to look some stuff up. This next part will probably tell you something about myself but, before I went inside, I tried my pens on the back of my hand. I had quite a few. None of them would write. This actually happens to me quite a bit as I tend to migrate from dusty dirty places to academic reading rooms and the dust often lingers and renders my ball point pens incapable. It was a problem. With what could I make my notes? There was a convenience shop next door to the library. I went in to buy some new pens. There was a guy sitting outside the door, holding up an empty coffee cup. He asked me for some spare change but I only had my pen money and so I couldn’t oblige. The man behind the counter had loads of pens, right up until he went and looked for them and found that he didn’t have any at all. He was sold out. Hopefully this kind of thing happens to other people as often as it seems to happen to me. People are just randomly and quite outrageously nice. This guy didn’t know me from Adam but yet here he was, giving me his only pen. He really insisted I have it. I’ll just type that again… he just wouldn’t. No, I don’t know why either. I generally try to be nice, I guess some people are encouraged to be nice back to me. To try to be fair, I bought a Mars bar that I really didn’t want because I am trying hard to reduce my sugar intake. The guy with the cup was still at the door. I gave him my pen money and the Mars bar too. Truth? I like to think that’s why the guy gave me the pen. A sort of Time Travel Karma. As a footnote to this first point, the library would not allow the use of pens. They supplied nice pencils. My second point is about wildlife in the city and how very close to it you can stand. On O’Connell Bridge, in the beating heart of the city, there is wildlife sitting there. It’s not foxes or bears or even rabbits. It’s seagulls. No, don’t go yet, let me tell you. Have you ever seen the seagulls that perch on the guarding of O’Connell bridge? They are Huge and they are right there. You can stand and look at them so that they are tiny inches from your face and they will stare defiantly right back at you. The ‘Danger’ in them is palpable. Their beaks are clearly razor sharp and they could easily lean forward and have your eye out with a savage peck. Their webbed feet (are they called ‘feet’? I can’t think) are so vivid and strong. Their feathery mane oily and stained from the city. In the wildest of the wild places, you could not hope to get so incredibly close to an untamed thing like you can there on O'Connell Bridge. It’s really quite something. I met my good friend J_ and we went to the lunch place at the top of Debenhams for a bite to eat. Up there, in a certain corner, there’s a bench that you can sit up at and have your dinner. Beyond it, there’s a void, all the way down to the ground floor. And out in front of you, through the full height atrium glazing, lies the whole of Dublin City stretched out before you. Look down, and you see all the little people milling around on their lunchtime missions. Look up again and there’s the city, stretching away off to the Wicklow mountain. That bench sure doesn’t look like much… until you sit down at it. Trust J_ to find that. He knows stuff, he does. Up there, looking out over the streets and buildings, I felt it again. I felt I belonged to the City and yet didn’t belong to it at all.